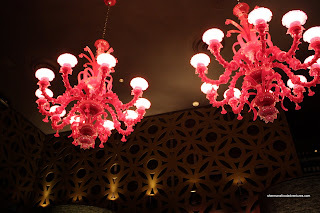 Initially, I was fortunate enough to be invited to the grand opening bash at Society Dining Lounge. Although it seemed like a fun event with a preview of the restaurant, food and vibe, I ended up declining the invitation. No, I was not snubbing a gift horse in the mouth. In fact, I'm always honoured to be invited to anything. I'm not in this for free food or anything; but hey, it's still difficult turning down free food! However, I've been to a few of these social events and honestly, it's very difficult to judge the food, atmosphere or service. Don't get me wrong here. I'm not saying that grand opening events are not useful . Of course they are. It's a great way for the restaurant to promote itself amongst industry people and the media. What better way than to get everyone together to showcase yourself. But for me, I personally like to sit down for a meal. So with the kiddies at the grandparent's place, Viv and I made a quick dash into Yaletown. Since the barricades for Expo and Pacific Blvd were still up, we had to take a huge detour to make it there. We were worried about being late and to our surprise, the place was empty. Apparently, the Olympic hangover had not passed. Well, that and it was a Monday night as well. Luckily Viv and I are on holidays and it didn't really matter to us. Now, we came to Society with realistic expectations. 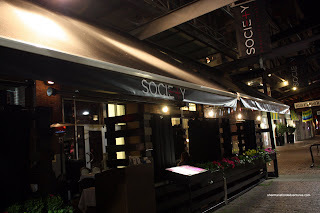 Despite its location and affiliation with the Glowbal Group, Society is not a fine dining restaurant. Rather, it competes with such places like Cactus Club, Earl's and Milestone's. The one difference is that Society is not a chain restaurant... or so it seems. I guess when you belong to a restaurant "group"; but go by a unique name, no one seems to notice it is part of a "group". I digress. Before we got our orders, we were presented with an amuse bouche. Yah, I was a bit surprised by that; however, it was a pleasant surprise. 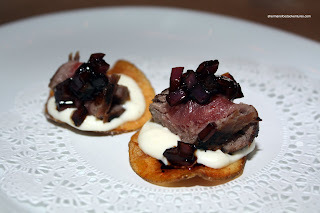 It was a slice of AAA sirloin atop horseradish aioli on a chip topped off with balsamic marinated red onion. We enjoyed the little bite. A nice horseradish kick complimented the tender beef. Despite seeing it and eating it, the onions took a backseat to the horseradish flavour. Only complaint is that the whole thing was cold. Not sure if that was intentional; but it would've been better warm. For our appy, we shared the Classic Mussels. For so me reason or another, most of the mussels were very small except for a few plump ones. Not really a criticism since you can't open them up to check before cooking... Just an observation. 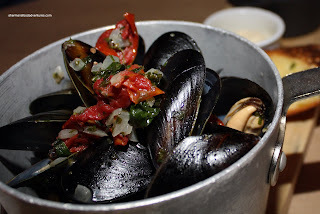 The mussels were prepared in a garlic, shallot and chardonnay with sun-dried tomatoes. Served on the side was garlic toast, fries and mayo. While munching on the mussels, we got more tomato flavour than anything else. Soaking up the broth with the garlic toast revealed a light chardonnay essence. 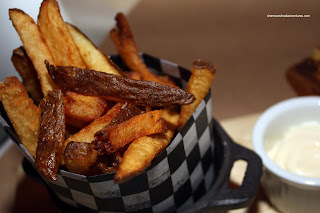 Despite its dark appearance, the fries were crispy and not overcooked. 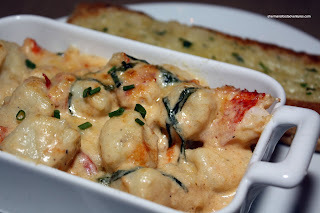 For her main, Viv selected the Lobster Gnocchi with tarragon cream and Parmesan gratin. Curiously, if you can see in the picture, there was not much in the way of gratin. Not sure why that is? No idea. We thought the fluffy gnocchi were a bit too big; thus overriding the fluffiness. There was a good amount of lobster swimming (ironic...) in a extremely rich cream sauce. There was clearly tarragon in the sauce; but it wasn't very apparent in taste. The sauce seemed quite one-dimensional being just plain creamy. For myself, I went for the Prime Rib Burger. 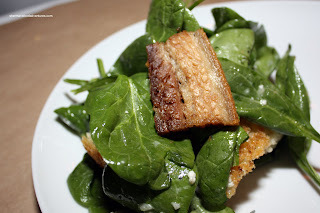 I substituted a Spinach Salad with pork belly for the fries. We already had fries and wanted to try something else. As you can see, the burger patty was cooked close to medium; but curiously, the meat wasn't exactly juicy . 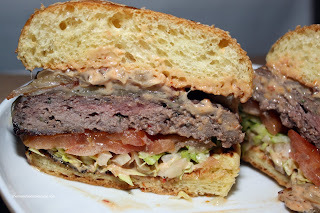 The inclusion of caramelized onions, loads of sauce, tomatoes, lettuce and bacon made this burger messy to eat (which is a good thing). However, there were 2 issues. First, the bacon was extremely fatty, which is not really a problem; but it was not crisp. Thus, it was chewy and a bit hard to eat. Second, the bun was too plain and boring. I would've preferred a Portuguese bun or soft kaiser bun over a plain sesame (it was dry). As for the salad, I thought it was pretty good. Tossed in a right amount of Rochefort cheese and topped with a crispy slice of pork belly, there wasn't much to dislike (well, I didn't like the large croutons). So if we look at the meal as a whole, it was pretty average at best. Nothing great; yet nothing horrible. Definitely middle-of-the-road food. For Yaletown, I think that the prices and portion sizes at Society are reasonable. If you factor in the discount from Let's Go For Dinner or discounted gift certificates found at Costco, the pricing is quite good. If one views this place from a fine dining point of view, it will never measure up because it's not (and it never claims to be). In fact, the marketing seems to indicate that Society is a place to hang out, be seen and to grab a drink in a casual; yet trendy environment. Thus, if we look at the comparable chain restaurants nearby (although, I still prefer Cactus Club personally), it's a viable option depending on your preference. Uh, staff, what staff? 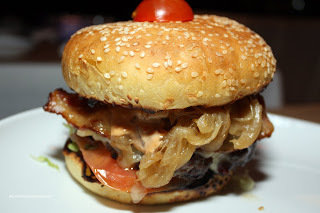 I did notice Viv sitting across from me... ;) LOL... Yah, the burger does look good doesn't it? It wasn't bad, but definitely not as good as it looked. Hi there. First time to the blog - I can't believe I haven't found it before. Great stuff! I respect your honesty of the reviews too!